Not to be confused with Hirta or Hidra. Hitra landscape with wind turbines, near Straum. Hitra is a municipality and an island in Sør-Trøndelag county, Norway. The municipality covers the island of Hitra and several smaller islands, and is part of the Fosen region. With a land area of 571.5 km2 (220.7 sq mi), the island of Hitra is the seventh largest island in mainland Norway, and the largest island south of the Arctic Circle. The administrative centre of the municipality is the village of Fillan. Other villages include Andersskogan, Ansnes, Forsnes, Hestvika, Knarrlagsund, Kvenvær, Melandsjøen, Nordbotn, Sandstad, and Ulvan. Hitra is famous in Norway for its large and dense population of Red Deer (as symbolised in its coat of arms — see image right). Hitra is a member of the International Island Games Association. 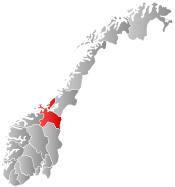 Hitra was established as a municipality on 1 January 1838 (see formannskapsdistrikt). On 1 January 1877, the northern district of Frøya (population: 3,949) was separated from Hitra to form a municipality of its own. On 1 January 1886, the southern and eastern parts of Hitra were separated into a new municipality of Fillan. This left Hitra with 2,241 residents. Then on 1 January 1913, the western part of Hitra was separated to form the new municipality of Kvenvær. This left Hitra with 1,439 residents. On 1 January 1964, the municipalities of Hitra, Kvenvær, Fillan, and Sandstad were merged to form a new, larger Hitra municipality. Prior to the merger, Hitra had 1,344 residents. The Old Norse form of the name was Hitr. The name is probably derived from a word with the meaning "split" or "cleft" (referring to the many inlets of the island). Until 1918 the name of the island and municipality was spelled Hitteren. The coat-of-arms is from modern times. They were granted on 7 August 1987. The arms show the head of a Red Deer in silver on a blue background. It symbolizes one of Northern Europe's largest populations of red deer which is located in the municipality. The Church of Norway has four parishes (sokn) with a total of five churches and two chapels within the municipality of Hitra. It is part of the Deanery (prosti) of Orkdal and the Diocese of Nidaros. Hitra is the seventh largest island of mainland Norway, and is bordered by Frøya to the north. It lies between the Trondheimsleia and the Frøyfjorden. The 345-metre (1,132 ft) tall Mørkdalstuva is the highest point on the island. Other than the large island of Hitra, there are many other islands in the municipality, notably Fjellværsøya, Ulvøya, Dolmøya, Helgbustadøya, and Bispøyan. The Børøyholmen lighthouse and Terningen lighthouse are located in the Trondheimsleia in the southeast part of Hitra municipality. The company Kystekspressen runs westamaran services from Trondheim and Kristiansund. 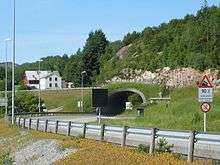 The 5,610-metre (3.5 mi) long undersea tunnel called the Hitratunnelen connects Hitra to the mainland to the south and the 5,305-metre (3.3 mi) long Frøya Tunnel connects Hitra to Frøya to the north. There is a wind farm in the central part of the island, Hitra Wind Farm, founded in 2004, which has 24 wind turbines which produce a total of 55 megawatts (74,000 hp). ↑ Rygh, Oluf (1901). Norske gaardnavne: Søndre Trondhjems amt (in Norwegian) (14 ed.). Kristiania, Norge: W. C. Fabritius & sønners bogtrikkeri. p. 63. ↑ "Sør-Trøndelag fylke". Retrieved 2008-10-28. Wikimedia Commons has media related to Hitra.